Chanteur Country US né Tony Wade Hayes le 20 Avril 1969 à Bethel Acres (Oklahoma). When Wade was a pre-teen, his father signed a contract with a Nashville-based independent record label and moved the family to the Music City. Within a year, the label had folded, leaving the Hayes family broke. They struggled back to Oklahoma, where Wade began playing guitar and singing backup in his father's band, Country Heritage. Following his graduation from high school, Wade went to three different colleges, but he decided to drop out of school to pursue music after seeing Ricky Skaggs on the 1991 Country Music Awards show. 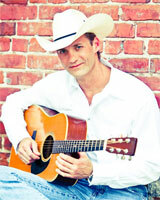 He moved to Nashville and beginning playing on demo tapes, all the while working on his own original material. Shortly after he settled down in Nashville, Hayes began writing songs with Chick Rains, who arranged an audition for the Vocalsist with record producer Don Cook (the Mavericks, Brooks & Dunn). Cook was impressed and began working with the singer, eventually getting him in contact with executives at Columbia Records. Old Enough to Know Better, Hayes' debut album, was released in 1995. The record was an immediate hit, with its title track becoming a number one single. The Academy of Country Music nominated him for Top New Male Vocalsist of the Year for 1995. Hayes' second album, On A Good Night, was released in the summer of 1996. Although it wasn't as big a hit as his debut, it still sold respectably. Hayes' third album, When the Wrong One Loves You Right, was released in early 1998 and Highways and Heartaches followed two years later. 02/2003 CD UNIVERSAL SOUTH B0000329-01 (US) .